A folklore professor (PERI GILPIN) bcomes unwittingly possessed by the ancient Japanese demons of Thunder and Lightning. 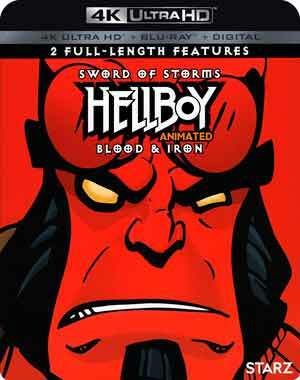 But when The Bureau of Paranormal Research & Defense dispatches a team of agents to investigate, a cursed samurai sword sends Hellboy (RON PERLMAN) to a supernatural dimension of ghosts, monsters, and feudal mayhem. Now, while pyrokinetic Liz Sherman (SELMA BLAIR) and fishboy Abe Sapien (DOUG JONES) battle one very pissed-off dragon, a lost and cranky Hellboy must find his way home. Even if he can survive the perilous journey, how much crap does a guy have to put up with from the two most vengeful and ferocious spirits of Japanese legend? When Hellboy (PERLAMN), Liz Sherman (BLAIR) and Abe Sapien (JONES) are assigned to investigate the ghost-infested mansion of a publicity-hound billionaire, they uncover a plot to resurrect a beautiful yet monstrous vampire from Professor Bruttenholm’s (JOHN HURT) past. But before they can stop her bloodbath, Hellboy will have to battle harpies, hellhounds, a giant werewolf and even the ferocious goddess Hecate herself. How much crap does a guy have to take from a Hungarian Blood Countess before he and his surrogate father can avenge the souls of the damned? It’s going to take more than just a horde of very pissed-off demons for our heroes to see the light. This two-disc set (1 UHD, 1 BD) comes with a glossy slip cover and inside is a Digital HD copy redemption code. This is pretty well stacked with features ported over from the Blu-ray release unfortunately all of them are contained on the 4K disc; the included Blu-ray is bare bones. A New Breed: Creating the New Hellboy (5:21) – This featurette goes into the designs and style for the animated feature. Conquering Hellboy: The Actor’s Role (6:28) is on the voice acting work of the main cast including Perlman, Blair and others and what they brought compared with the live action version. A View from the Top: The “Heads” Sequence (5:26) breaks down one of the key scenes in the movie from the short story in the comics and translating it into animation form. 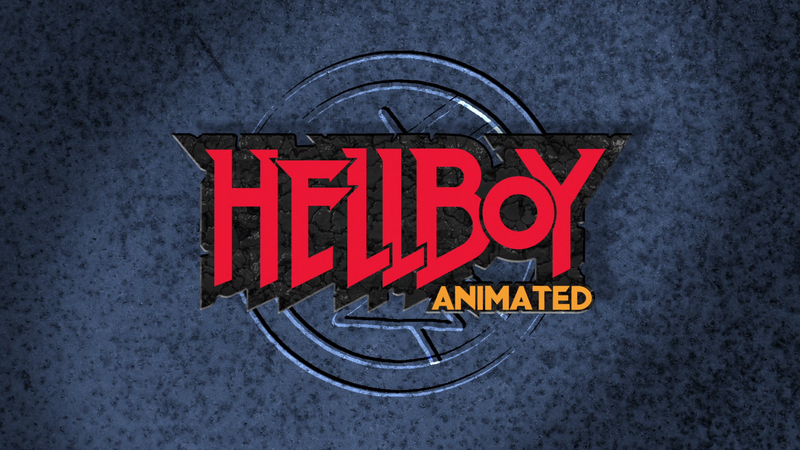 Audio Commentary – ‘Hellboy’ Creator Mike Mignola, Supervising Producer/Director Tad Stones and Director Paul Weinstein. Reversal of Fortune: Professor Broom’s Story (20:24) shows his story in chronological order versus the Memento style in the film. Tales from the Tomb: A Look Inside Blood & Iron (12:59) is a behind-the-scenes featurette on the creation of this animated sequel. Iron Shoes with Introduction by Mike Mignola (3:42) is just an animated short. 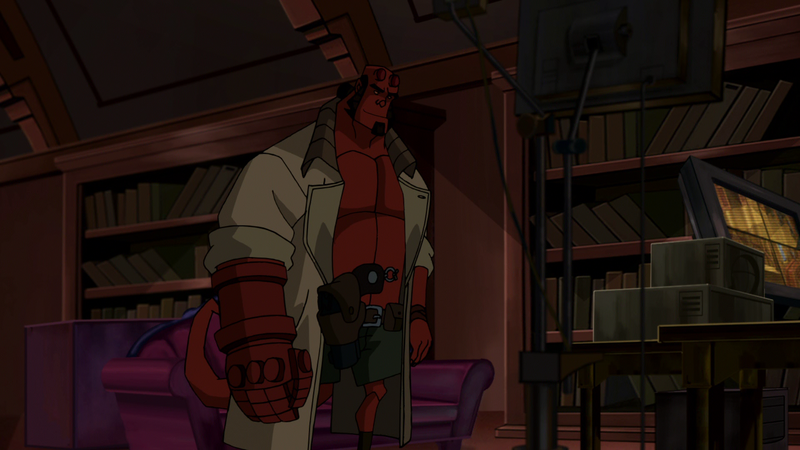 Hellboy Animated comes to 4K Ultra HD presented in its original 1.78 widescreen aspect ratio and a 2160p high-definition transfer. Kind of strange for something like this to get a 4K release, even with the reboot coming out in a couple of weeks at the time of this writing. 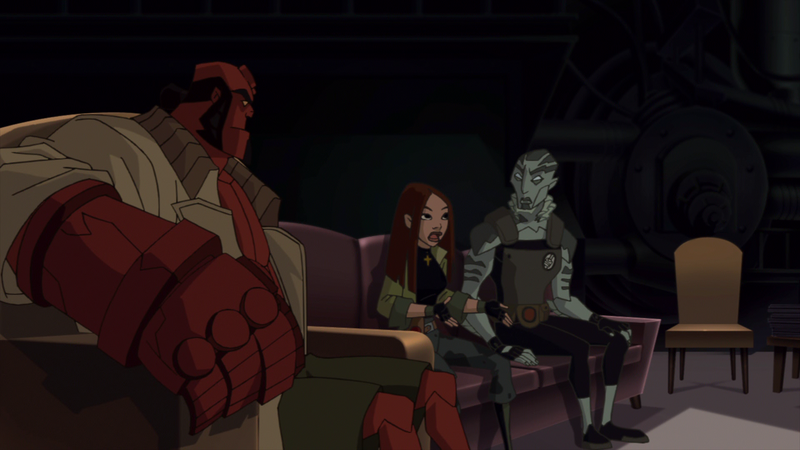 Whatever the case, both of these animated films do look quite good with sharp detail and the HDR really giving the colors some vividness with the reds on Hellboy a nice pop as does the variety of colors within the supernatural dimensions. Both of the movies get an additional boost in the audio department with a Dolby Atmos track. Nothing especially profound or anything, but still outputs clear dialogue via the center channel and great depth from the front and rear speakers. With the Hellboy reboot coming out, Lionsgate tries one more time to capitalize on a franchise that didn’t do so well and also serving as an advert. In any case, I did enjoy both of these animated movies and really wish they had continued, but I suppose with Hellboy II being a flop, any plans for further animated films were scrapped. This 4K UHD release comes with great video and audio transfers and a fine selection of bonus features.